The Newman Eco Elegance high efficiency gas fire is a wonderful versatile design as it can be used either with our stainless steel fire trim and polished fire front to give a more traditional effect but in a much larger size than usual or the fire can be used without the trim and front but using a suitable stone or marble fireplace to house the fire as shown to our other high efficiency gas fire models. Class 1 efficiency rated at 82%. Realism, class and style with lower running costs make this a winning fire. The Newmans high efficiency gas fires have hand held remote control with a choice of cream or black fire chambers, a reflective smoked glass chamber is available as an optional extra to enhance even further the fuel bed with leaping flames, simply magical. Optional non reflective facia glass available making the glass frontage nearly invisible. 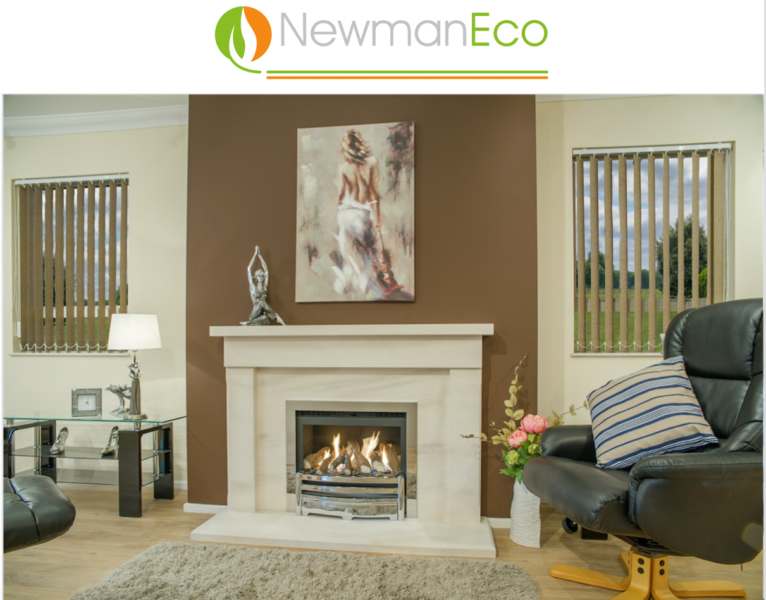 Shown with the Newmans Cromwell natural stone fireplace, straightforward styling and clean lines make this fireplace a popular choice and a perfect combination when used with the Newman Eco Elegance high efficiency gas fire.